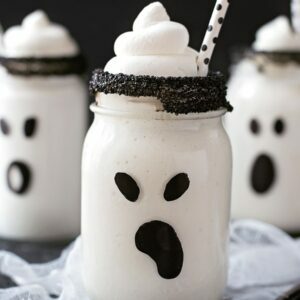 Boo-nilla Ghost Milkshakes - delicious vanilla treats turned into adorable ghosts that are perfect for Halloween! Divide the milkshake between the glasses. Cut the corner of a large ziploc bag and pipe a swirl on top. Serve immediately.